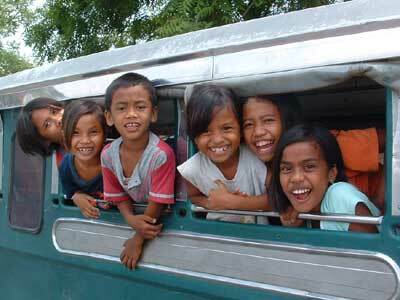 Little by little, I'm trying to see all of the Philippines. Last week, on my way home to the USA from Cebu, I stopped off in Manila so I could travel up to Tarlac Province in northern Luzon. 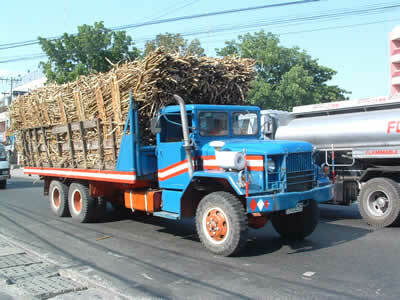 The busy MacArthur Highway (named after Lt. General Arthur MacArthur, Jr, the military Governor-General of the American-occupied Philippines from 1900 to 1901 and father of Douglas MacArthur), which traverses Tarlac, is full of heavily-loaded sugar cane trucks. Where do they all come from? 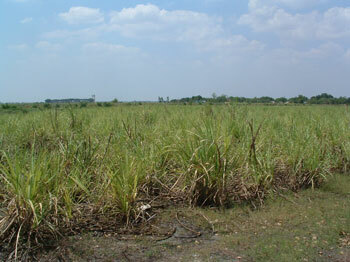 Much of the sugar comes from Tarlac's most (in)famous piece of real estate, Hacienda Luisita. Comprising 6400 hectares (15,814 acres), Hacienda Luisita is the second largest single piece of contiguous land in the Philippines (after the 20,000-hectare Canlubang Sugar Estate of the Yulos in Laguna.) The estate was purchased in 1957 by the Cojuanco-Aquino family, one of the small number of oligarchic families who "own" the Philippines. Entrance to Hacienda Luisita, San Miguel, Tarlac City. 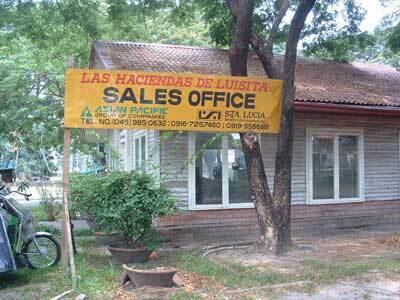 When I got off the jeepney in San Miguel, my first stop was the Las Haciendas de Luisita sales office. Part of the vast hacienda has been converted into a residential development. To quote the sales brochure, "Enter the world of Hacienda Luisita....a 121-hectare of five villages named after the second generation Cojuanco sisters: Carmen, Corazon, Josefine, Pacita and Teresita. A sprawling community surrounding the Luisita Golf and Country Club....with individually titled lots, a fully operational sports complex, Spanish-Mexican inspired multi-purpose community clubhouse, function room, swimming pool and picnic area." The sales agents suggested I tour the Hacienda and look at some of the available lots....but upon discovering that I hadn't brought my car ("You're riding a JEEPNEY?!? "), they suggested it might be better if I were to come back another time. I decided it was time to see the Hacienda. I asked around and was advised to ride a (motorized) tricycle into the estate. For once I followed local advice, P60 for a one-way ride. We drove past miles of pastoral sugar cane fields. In about five miles we arrived at the great Central Azucarera de Tarlac, Hacienda Luisita's sugar refinery and one of the largest in the Philippines. ITULOY ANG LABAN NI KGD ABEL LADERA PARA SA KATARUNGAN NG MGA MINASAKER SA HACIENDA LUISITA!" 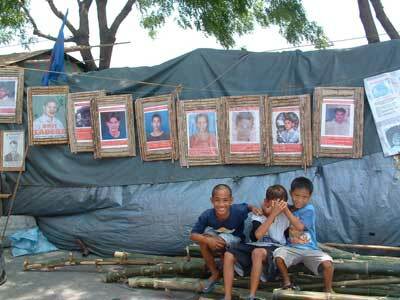 In a violent strike dispersal in Hacienda Luisita last November 16, 2004, 14 people were killed, including two children aged 2 and 5 years old who died from suffocation from teargas lobbed by the police and army dispersal teams. One of the victims was allegedly strangled after being shot and his dead body hanged in the factory's gate. At least 35 people were reported to have sustained gunshot wounds, 133 were arrested and detained, hundreds were wounded and another hundred still missing. The carnage is a gruesome reminder of the infamous Mendiola Massacre and Lupao Massacre, which also arose from the peasants demand to own their land. More than the issue of wage and jobs, land distribution, land distribution remains to be the major demand of Hacienda Luisita workers. The workers, led by ULWU, are calling for the scrapping of the Stock Distribution Option (SDO), which the Cojuangcos used to purportedly escape land distribution to its tenants under the Comprehensive Agrarian Reform Program (CARP). Ironically, it was then Pres. Corazon Cojuangco Aquino, whose family owns the Hacienda, who signed the CARP law in 1987. Gate 1, site of November's massacre. 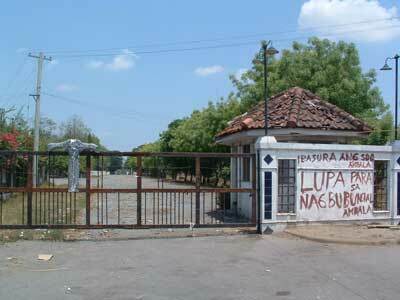 Today it's a quiet place, the giant sugar refinery behind it still shut down by the continuing strike. Martyrs: Photos of striking workers killed by soldiers and police. I spoke with Rene Tua, an advisor to the CATLU union. He told me that during the last negotiation between the union and the company, they were offered a raise of 48P (.88 cents US) per day. The union is asking for an additional 150P ($2.77 US) per day during the first year of a new CBA (collective bargaining agreement.) The previous CBA expired in June 2004, and the workers have been without one since then. In spite of the militant banners and flags, friendliness of the picketers, and enthusiastic curiosity of the children, the scene was depressing. I wonder if the Cojuanco clan has any motivation to even negotiate at all? 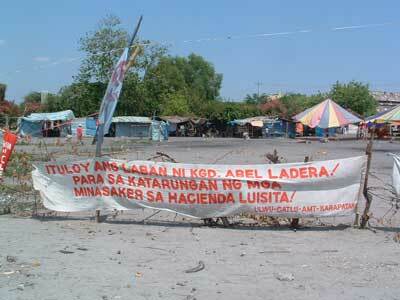 The future of Hacienda Luisita is clearly not with sugar. 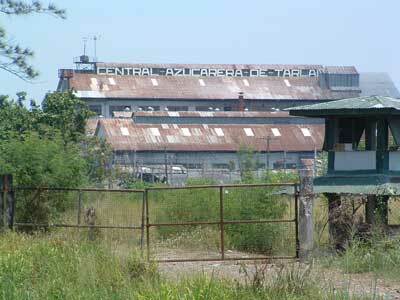 On the way back out to the highway, I passed two new industrial parks within the hacienda. I saw a map showing planned development within the hacienda: the proposed North Luzon Expressway will run right through the middle of the hacienda (it's nice to have friends in high places) and will be surrounded by residential subdivisions and industrial parks. These have much higher profit potential than an industry such as sugar where global prices have dropped and the workers have shown a disinclination to continue living as slaves. 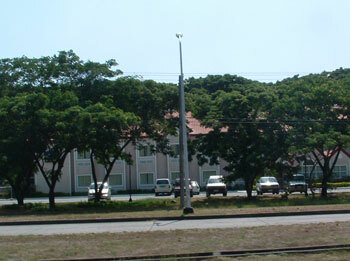 A land use plan (LUP) was prepared in 1996 outlining the planned comprehensive land conversion of the entire Hacienda Luisita into a commercial and industrial complex. According to the Bulatlat online journal, The Hacienda Luisita Land Use Plan shows that the family of former President Corazon Cojuangco-Aquino plan to convert all its agricultural lands in Tarlac into commercial, industrial, residential and recreational parks. 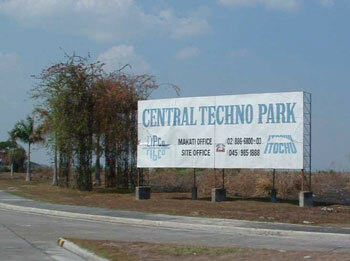 Getting ready for the full-blast conversion, several parts of the hacienda have already been converted to alternative uses since 1989: the Luisita Industrial Park 1 (120 hectares), the Aqua Farm and Homesite Phases I and II (50 hectares), the Luisita Business Park (20 hectares), the recently-converted Luisita Industrial Park 2 / Central Techno Park (500 hectares). If the plan is fully implemented, more than 5,000 sugar farmers stand to lose their jobs and worse, their right to Hacienda Luisita as farm beneficiaries under the Comprehensive Agrarian Reform Program (CARP). Interestingly, in 1986 newly-seated President Corazon Aquino announced that land reform for millions of landless farmers would be the central platform of her new government. Yet while she presided over passage of the landmark CARP land reform law, she pointedly excluded from the process her own family estate of Hacienda Luisita. 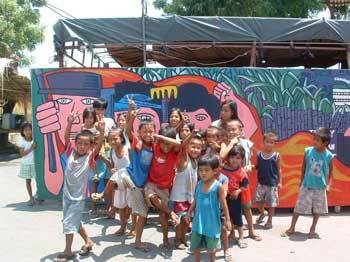 For many, this exposed the hollowness of her commitment to promoting progressive social change in the Philippines. Earlier, when I had been invited to tour the Las Haciendas de Luisita Homesites, I noticed that one of the five villages was named Corazon. The President who trumpeted land reform has an exclusive residential subdivision named after her, on the family estate which was intentionally excluded from land reform....the true legacy of "People Power" in the Philippines. 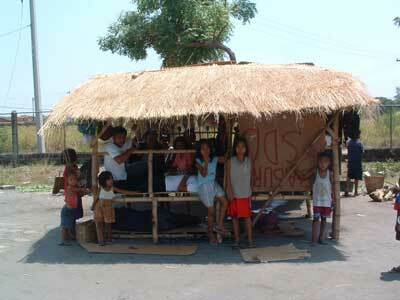 When Hacienda Luisita is full of factories, villas and golf courses, where will these children of sugar cane workers live? 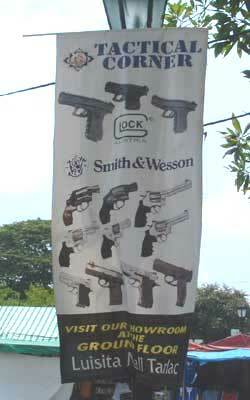 Outside the mall, I spotted some advertising banners. 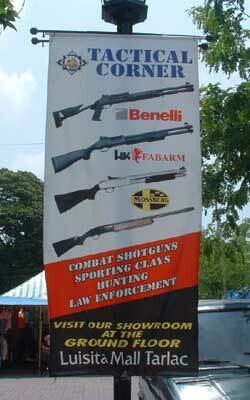 I guess it's important to keep local security forces well-equipped in order to assure that the Hacienda Luisita Land Use Plan gets implemented without "bothersome interference." 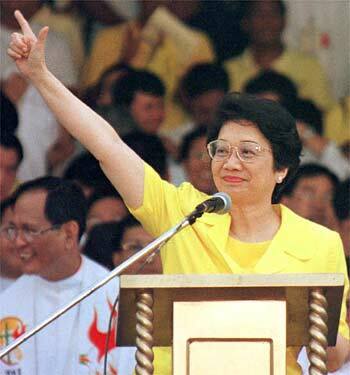 In 1988 then-President Corazon Aquino launched the Comprehensive Agrarian Reform Law (CARP) as the "centerpiece program" of her administration. She initially vowed to place her family's 6,400 hectare estate under the land reform. In 1989 her government allowed Hacienda Luisita to adopt the so-called Stock Distribution Option (SDO) under which the 5,000 HLI (Hacienda Luisita Incorporated) workers obtained shares of stock in the company instead of individual titles to the hacienda land. This was widely viewed as an attempt to skirt the CARP redistribution of the hacienda. In December 2005 the Presidential Agrarian Reform Council (PARC) and Agrarian Reform Secretary Nasser Pangandaman issued an order revoking the SDO agreement, instead directing that the hacienda land be parceled amongst the tenant farmers. Critics interpreted this as a politically-motivated slap at Cory Aquino for having called on President Arroyo to resign following the "Hello Garci" election scandal. In June 2006, the Supreme Court reversed the PARC order by issuing a temporary restraining order (TRO) against the PARC plan to parcel out Hacienda Luisita to farmer-beneficiaries. 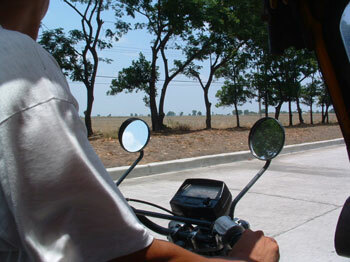 In March 2007, the Supreme Court of the Philippines ruled that sugar lands remained within the coverage of the Comprehensive Agrarian Reform Program (CARP.) In response, the Cojuangco family petitioned the court to honor the stock distribution option (SDO) scheme at the hacienda. The Supreme Court is expected to issue a ruling on the petition at some future date. As of June 2007, the legal case surrounding the property in still in limbo. The Cojuangco family continues to run the hacienda while the workers who have been tilling the land for years remain in limbo. While awaiting a pending Supreme Court decision on their ownership of the Hacienda, workers increasingly began to till more of the land on the estate. As much as 2,000 hectares were planted with cash crops like corn and vegetables. Lito Bais, presiding officer of the United Luisita Workers Union (Ulwu), began urging the workers to plant rice, saying that while Luisita farm workers who are CARP beneficiaries cultivate less than a hectare each, their harvests go a long way in sustaining their families. In April, Hacienda Luisita management issued a memorandum asking 500 Luisita farm families to leave, giving them until Oct. 30 to stop planting and occupying portions of the estate. Estate Manager Herman Gregorio Jr. said the notice was issued to "preserve the tone of peace, harmony and unity in HLI." United Luisita Workers Union president Rene Galang called the deadline a "memorandum of death" and a "ploy to remove" the farmers from the vast property. He noted that it came a day after Congress approved Joint Resolution No. 1 that extended the CARP for six months without the compulsory acquisition scheme. In November, Herman Gregorio announced that the deadline for eviction of the farmers from the Hacienda had been extended indefinitely. The Hacienda had been asking the farmers occupying and planting land on the estate to register, but apparently few had done so. 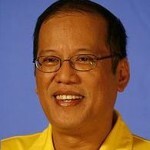 On May 10, Noynoy Aquino was elected as the new Philippine President. He is the son of Corazon and Benigno Aquino Jr., and claims he owns less than a 1% stake in the hacienda. He has suggested that the family is considering a scheme to transfer part of the property to the 10,000 farmer-beneficiaries currently residing there. However, he has bristled at the media attention which the estate aroused during the electoral campaign, charging that his opponents were using Hacienda Luisita as a political issue: "Di mahalaga sa kanila ang katotohanan. Kami na nga po ang naaapi d'yan (The truth is not important to these people. We are the oppressed party in this issue.)" Time will tell what he really plans to do with the estate during his presidency. In August 2010, the hacienda announced it had negotiated a "compromise agreement" with farmer-beneficiary representatives under which the 10,502 farmer-beneficiaries recognized by HLI would be allowed to choose whether to retain their shares under the SDO or surrender these in exchange for land. The settlement was quickly implemented by HLI with many farmer-worker beneficiaries being given cash benefits in exchange for agreeing to give up their claims to receive land titles on the estate. The Hacienda claimed to have made P20 million available for distribution, and individual cash awards ranged from P1.68 up to P9000. 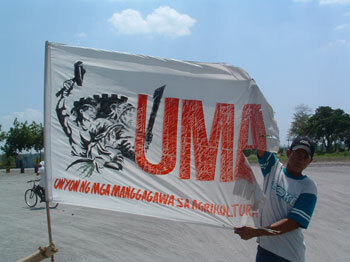 Critics immediately dismissed the "compromise agreement" as a cynical attempt by HLI (Hacienda Luisita, Inc.) to make an end-run around the pending Supreme Court ruling on the constitutionality of the SDO (stock-distribution option) which had been voided by the Presidential Agrarian Reform Council in 2005. July: Supreme Court denies petiton to reverse revocation of stock distribution option. 1. The Court denied the HLI (Hacienda Luisita, Inc.) petition to stop the Presidential Agrarian Reform Council ruling upholding the Department of Agrarian Reform (DAR) revocation in 2005 of the estate's 16-year-old stock distribution option (SDO); in other words, the DAR revocation still stands. 2. 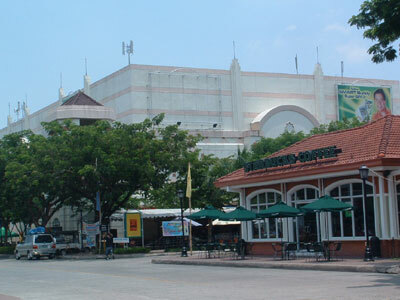 The Court also stated that they could not "turn a blind eye" to the overwhelming vote for SDO in 1989 of the 6,296 farmer-worker beneficiaries (FWBs) and called for a new secret balloting (referendum) under the supervision of the Department of Agrarian Reform (DAR) to determine once and for all what the farmers wish. On August 15, Supreme Court spokesperson Jose Midas Marquez held a press conference to clarify that the Court had not ordered a "referendum" among farmworker-beneficiaries of Hacienda Luisita; rather, the order allowed each farm worker-beneficiary (FWB) to choose individually whether they wanted to own actual land or remain a stockholder in Hacienda Luisita Inc. (HLI). 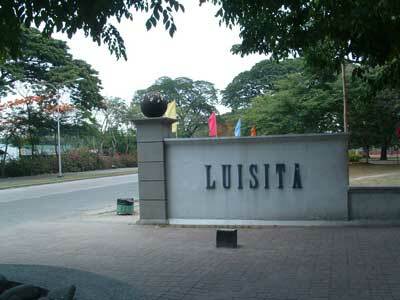 November: Supreme Court orders distribtion of Hacienda Luisita to farmer-beneficiaries. On Nov. 22, the Supreme Court issued a "final decision" on the case and ordered the management of Hacienda Luisita Inc. (HLI) to distribute 4,915.75 ha of the sugar estate to 6,296 registered farmworker-beneficiaries in accordance with the 1988 Comprehensive Land Reform Law (CARL.) The high court also voided the SDO scheme being implemented by Hacienda Luisita, saying this had not benefited the farmers who had been working the land for generations. April: Supreme Court issues "Final ruling." On April 24, 2012, the Supreme Court of the Philippines affirmed by a vote of 14-0 its 2011 ruling mandating distribution of 4,195 hectares of the hacienda to 6,296 farm worker-beneficiaries. The court set the 1989 land valuation of around P173 million as "just compensation" to the Cojuangco family in exchange for distributing the land, denying the family's request for P10 billion compensation. In response, HLI (Hacienda Luisita Incorporated) filed a motion for reconsideration and clarification against the high tribunal’s ruling. Farmworker-beneficiaries were jubilant about the decision. (Rappler.com):"Almost 3 decades since the agrarian reform law was passed, farmers of Hacienda Luisita - the sugar estate of President Benigno Aquino III's family - finally started receiving their share of land on Thursday, July 18. 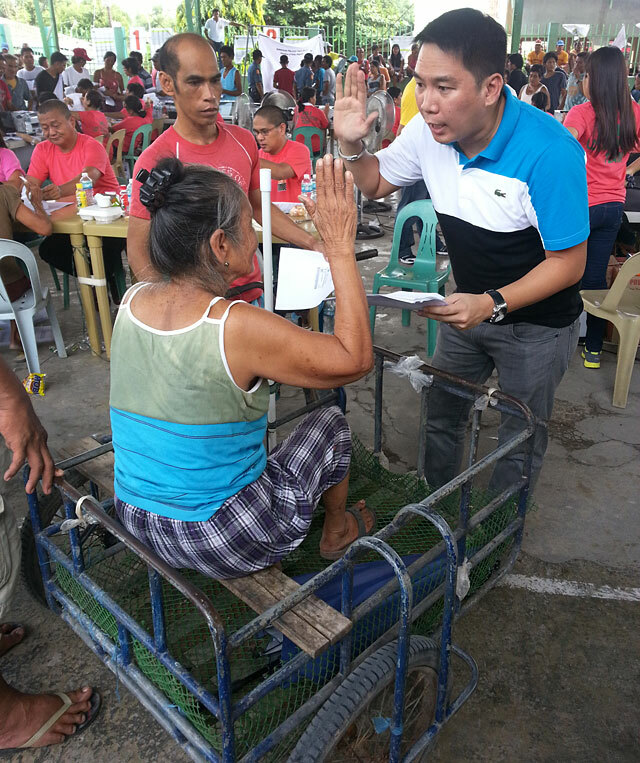 The Department of Agrarian Reform (DAR) distributed the first batch of lot allocation certificates at Barangay Cutcut in Tarlac City. 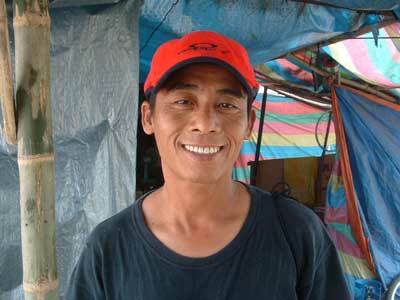 Of the 646 qualified farmers from Barangay Cutcut, 340 jumpstarted the process of possessing their land. Other barangays still waiting for their turn include Bantog, Balete, Asturias, Lourdes, and Mapalacsiao in Tarlac City; Parang, Pando and Mabilog in Concepcion; and Motrico in La Paz. Some 4,000 hectares of the 6,000-hectare sugar estate will be distributed to recipients." April 25, 2012: I've observed that many people have downloaded and used my Hacienda Luisita Entrance photo on their websites. As a public service, here are some larger versions of the photo which you are welcome to download and use as desired. Please give me attribution OK? Common courtesy, thank you.